The procedure typically takes anywhere from 1 ½ hours to 2 hours, depending on the number of lashes being applied per eye. Clients are comfortably reclined on an esthetic bed with their eyes closed, and lower lashes are covered to prevent the top lashes from adhering to the bottom lashes. The procedure is often referred to as “Beauty Sleep” as it is non-invasive, painless and so relaxing that clients typically fall asleep then awaken to lush, beautiful lashes. I am trained to design and “style” lashes to suit the needs of the client. I will conduct a consultation with my client and take into consideration the client’s eye shape, condition of natural lashes, facial features, skin tone, and the lifestyle and preference of the client. I will then select the appropriate lengths, curvatures, thicknesses and colors to customize a unique, individual look for the client. Virtually any look can be created, from a natural, subtle enhancement to the highest-impact drama queen lashes in town. The look can last indefinitely with 45 minute refills every 2-3 weeks. 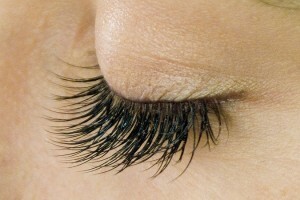 Like your scalp hair, natural eyelashes grow and shed in a cycle, which is typically about 60 days (2 months). When a natural eyelash matures and falls out, a new eyelash has already been growing and quickly replaces it. People typically shed between 1 and 5 natural lashes each day, depending on their individual growth cycles. 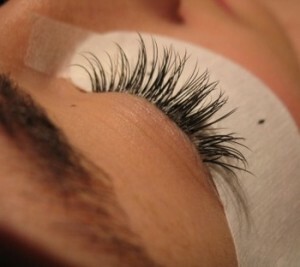 When properly applied, extension will remain in place until the natural lash on which it rests falls out. Refills are necessary to replenish the fallen hairs and maintain the look. You can apply Protective Coating once or twice per week on your new lashes to preserve the look and extend the life of your Lash Extensions. Brush on from the base up to the tips. This coating also gives the lashes a wonderful shine! I recommend getting a touch up every two to four weeks to maintain maximum fullness of you Eyelash Extensions. 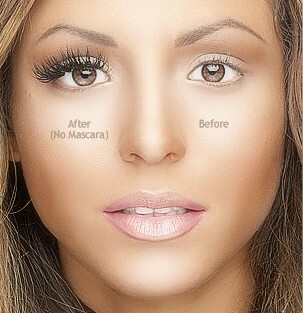 Eyelash Extensions allow you to spend less time with makeup; mascara is certainly no longer necessary. Because our lashes are bigger at the base, they create the same effect as eyeliner so that step can be avoided as well. Overall, Eyelash Extensions will give you the appearance of having put significant effort into your eye makeup when, in reality, you spent no time at all. No application of eye makeup and no need for removal at the end of the day. The added benefit is that they look beautiful morning and night, all day, every day. Say goodbye to the application of mascara, stained tears and mascara raccoon masks around the eyes. With Eyelash Extensions you can look and feel gorgeous from the moment you wake up until the moment you fall asleep with little to no effort. where do you get this or buy it?